Are you searching for the best Orlando commercial laundry equipment company? Look no further than the experts at Commercial Laundries. We have built our life around the commercial laundry industry and have helped thousands of Florida businesses thrive since 1967. At the heart of every relationship we build with a client is our mission to provide consistent, top tier customer service. We understand for your onsite commercial laundry facility to be as profitable as possible, we need to offer unmatched customer care and build a relationship on trust and a customer-centric approach. When you need to service commercial laundry in Orlando, or if you are seeking to outfit a new onsite facility, our team offers you everything you need. From helping you set-up your facility, discussing total laundry solutions for your tenants, helping you determine if purchasing or leasing is your best option, or customizing a management partner contract, our team wants to see you succeed. Our relationships with our clients are continually built on trust, communication, hard work, commitment, and dedication to attend to your needs promptly, meet and exceed your expectations, and provide you with the support you need to run your business. 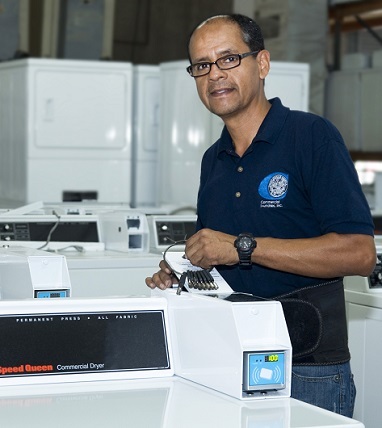 When you work with Commercial Laundries, you have access to bi-lingual service agents fluent in Spanish and English. Our representatives are available through phone, email and fax and can help you set up a service call, resolve any problems or concerns, request an initial meeting with one of our team members, or answer any questions you may have. If you are calling regarding a service call, our representatives will take your information and dispatch the message to one of our fulltime, professionally trained service technicians. Our goal is to service equipment within 1 business day of receiving your message, however, many of our service calls are completed on the same day they are requested. When you need to learn all you can about setting up and operating the most profitable commercial laundry space possible, the Commercial Laundry sales team is at your service. Our team members make up some of the most knowledgeable commercial laundry sales people in the industry. They are excited to help you discover ways to develop, manage and grow your onsite laundry facility. In addition to helping you achieve your goals, our sales team will be at your service and work alongside you long after you sign your contract. One way we provide you with top tier customer service is through our skilled and knowledgeable service technician team. We believe in keeping our service technicians up to date on the latest technology and equipment and do this through providing them with ongoing educational programs and certification courses. Our service technicians are committed to getting your commercial laundry equipment back in working order as quickly as possible. In addition, our service technicians are fulltime employees who typically have their own route. This allows our technicians and clients to build a strong relationship with one another and helps ensure quality service throughout the lifetime of the contract. Find the Orlando commercial laundry customer service you need by partnering with Commercial Laundries. Contact us directly through this website, or by phone, fax or email. We look forward to serving you!